The memsahib and I received a new game for Christmas, called “Discovering Europe” by Gosling Games. On Christmas day we played it around ten times with our guests, the donors of the game. It is a fun, card and die based, tactical game in which the objective is to visit a number of European cities while obstructing the other players from visiting their allocated destinations by putting barriers in the way or “inviting them to join you”. 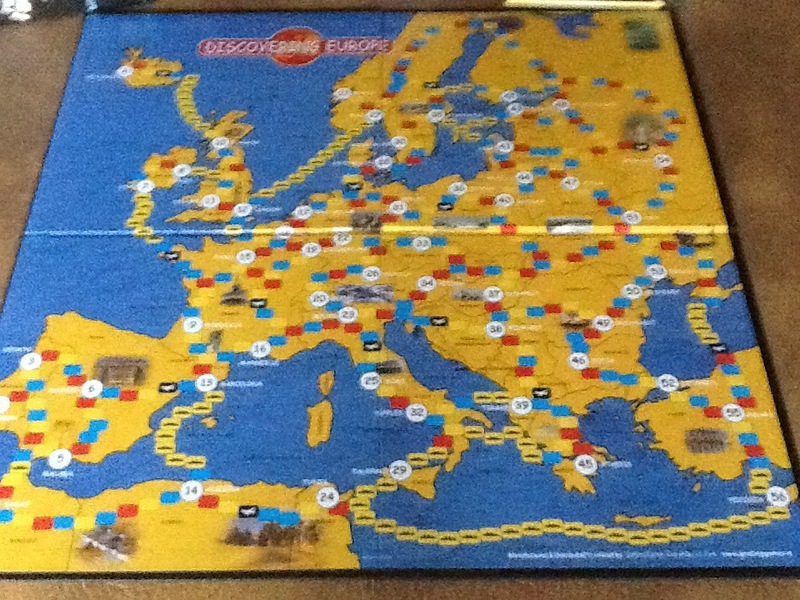 There are 56 cities on the game board, covering the area Reykjavik – Moscow – Nicosia – Rabat, connected by marked routes of red, yellow and blue rectangular spaces, with some airports and sea routes marked by ship icons. So let’s say that the yellow is open cultivated land, red is hills and blue is a major river crossing. Do you see where I am coming from? Ignore the airports and we can use it for any period from antiquity to early 20th Century. The thirteen airports are in an eclectic range of places: Iceland, Sweden (well north of Stockholm), north-west of Moscow, Schleswig-Holstein, west Poland, Brittany, central France, north Croatia, Milan-ish, west of Barcelona, FYR Macedonia, the Black Sea!!! And Algeria. On reflection, I think they are best ignored completely. They can become “wildcard” terrain features, except for the Black Sea. Apart from the airports, there is the usual “Risk” like route limitation. While you can get from Tunisia to Cyprus by a long sea route, the only way from Norway to Iceland without flying is via London, Cardiff and Glasgow. Likewise, Spain can be isolated by holding Gibraltar and Andorra.